Ekko Effect’s with a new track called Rock a Bye Baby featuring Bad News and L the Twelfth Letter. Check out the dope track and Ekko and L’s Thght Process Q & A below. Toronto emcee who is not your typical post-new school rapper chasing big bucks, European cars and R&B chicks. I am here hoping to use hip-hop to give a voice to those that wouldn’t have one otherwise, and shine a light on the struggles that the people of today’s society face. L The 12th Letter-I’m an emcee from Toronto who goes by the name L the 12th Letter. I differentiate myself as an emcee as opposed to a rapper, because anybody who can spit a 16 can call themselves a rapper but it’s the MC who spits a bar and makes it stick to the hip-hop culture for years to come. Ekko Effect-Ekko is passionate about improving himself and his community and it is evident in the topics he tackles in his songs. I also has bigger goals than music and plans on one day opening a community arts centre where kids can learn to read and write, play instruments and work toward their career goals. L The 12th Letter-It goes without saying that my passion is music. As an artist, the pallet I paint from is hip-hop but that doesn’t mean I’m limited to it; I am a lover of all music and a fan of the cultures of which they grew out of. Ekko Effect-I would definitely have to say my kids, they complete me in a way I never thought possible, also the completion of my Social worker diploma. I just finished my first mixtape, titled Knowledge Speaks, Wisdom Listens, furthering his goal to better the lives of others through music. Bad Newz and DJ Smartiez. 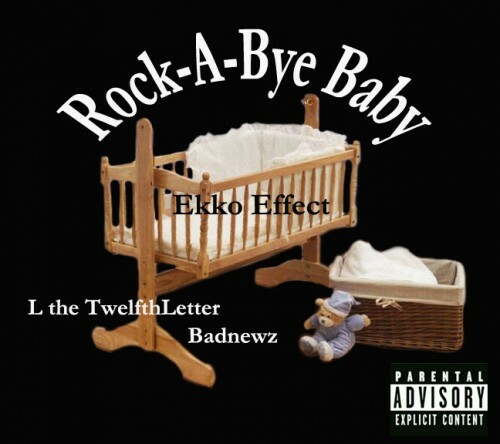 L The 12th Letter-This past year (2011), I released two mixtapes ((Just Rap June ’11, The Last 12 Months Apr ‘11) that have garnered a great fanbase and a lot of positive reviews in both Toronto and throughout the U.S. That’s definitely one of my greatest accomplishments as an artist. Personally, my greatest achievement has been overcoming the stigmas that are put on Toronto artists and carving out my own niche in an industry where you can be chewed up and spit out, only to have people anxiously awaiting my next projects and following my journey. Ekko Effect-Life is short and even though we all make mistakes, no mistake is too big to ever come back from. There’s nothing wrong with making mistakes, we all do, what’s wrong is letting it stay as a mistake without the effort of making it right. L The 12th Letter-The only thing I say to the doubters is that I love y’all! I mean, making haters into people who believe in me certainly isn’t my main objective but by consistently putting out music and showing my drive as an artist, I do believe it’s something that will sway them towards becoming fans of the 12thLetter. L The 12th Letter–You can find my music on my Bandcamp(www.12thlettermusic.bandcamp.com), Facebook (www.facebook.com/12thlettermusic) and Twitter (www.twitter.com/Lthe12thLetter). On a last note, look out for me in 2012, because big things are happening and my music is going to be more accessible on various levels sooner than you think!